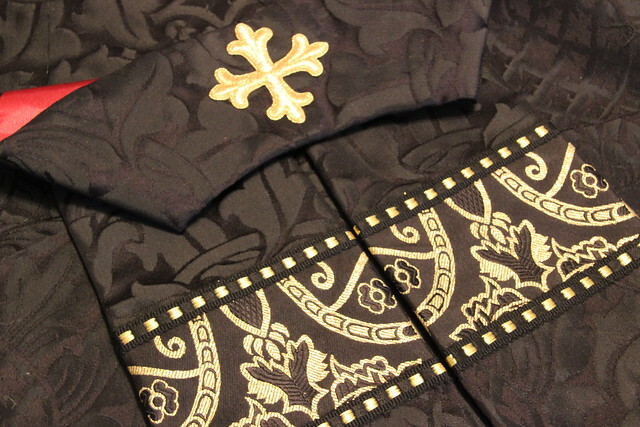 Have you ever wondered or thought about using one of the beautiful Ecclesiastical Fabrics to make vestments for your church or parish? You may have looked at a few fabrics, thought about things, made a few choices, thought some more, and just when you are ready to give the project a try, two dreaded words crop up to stop you dead in your tracks. The thought of dealing with an unknown such as “pattern repeat” can strike fear in the hearts of seamstresses and tailors of all skill levels. It is that unknown and unfamiliar, and exactly what does one do with it, that strikes terror in the hearts of the most determined of workers for the church. Although we have looked at pattern repeats before here on Ecclesiastical Sewing, the subject is one requiring much attention. Knowing and understanding how to work with pattern repeats removes the mystery surrounding these troublesome designs, and builds confidence. It takes training of the eye and the mind. So let’s get started! This lovely Ecclesiastical Brocatelle fabric which was used for the Ash Wednesday and Good Friday Vestment set has a pattern repeat. But not a tiny, regular pattern repeat. It is a whopping 17″ pattern repeat. What a fabric! And 17 1/2″ is a pattern repeat that takes some care and attention. Although the pattern repeat may at first sound daunting, if not downright scary to deal with, it really is a wonderful fabric to work with. Look closely and I will attempt to show you why. Select a point on the fabric to discover the pattern repeat. There is a tiny arrow at the point or peak of the gold border which is an Ogee pattern. Now continue along the length of the fabric until you come to the same point in the design. The distance between the two points is the length of one pattern repeat. In this instance, 17 1/2″ is the lengthwise pattern repeat. This fabric also has a pattern repeat on the width which is easily determined by measuring the distance between the two black dots located at the base of the gold frame in the above photo, which is also an Ogee. The pattern repeat for the width is 12 1/2″. It is always a good idea to become familiar with the patterns of a fabric like this before doing any cutting. The above photo shows the main motif in the fabric. Although this is the main motif, there are may other smaller motifs. Play a game of “Eye Spy” with yourself. I often leave the fabric out for a period of time to study the design and become familiar with places that might work for cutting. Thinking about focal points within the design, I discover where and how those focal points might be used on the pieces being made. Notice how the designer of this Ecclesiastical Brocade created this smaller Ogee pattern to fit inside the four larger Ogee Designs? The smaller design is very similar to the larger version. Take a closer look though. Can you spot a few things that are different? Notice the top and bottom of the Ogee in both sizes. After studying the designs for a while, various motifs within the design should start standing out. For instance, the black dot connecting the bold gold frames for each of the large motifs is very noticeable. Looking at the reverse side of an Ecclesiastical Fabric. Try a new experiment. Flip the Wakefield Fabric over. This is the Gold side of the fabric. Did I mention it was completely reversible? This shimmering gold side is quite different to look at. The gold threads make the entire piece shimmer in the light. Do the designs look different, or are they easier to see with this side? Now that you have become a little more familiar with an Ecclesiastical Brocatelle, where does one make the cuts? There are many options for cutting with this fabric, but much depends on the size of orphreys needed. A large Cathedral with an altar that is 8 or 9 or more feet wide might be able to handle an orphrey that is 12″ wide. Remember those black dots? In the above photo, the black dice trim was placed on the fabric, crossing the black dots between the large motifs. This would end up as a 12″ (give or take about 1/4″) orphrey. Not everyone has a 12 foot altar in a large cathedral. Many of us have much smaller altars. So, the size and scale of the orphrey needs to be reduced to better fit with the space. The fabric is designed to offer orphreys of different sizes with slightly differing designs. This is a great feature of this fabric! It can add a little variety to a set. Let’s take a close look so you understand. Notice the point of the black frame in the above photo? By placing a piece of dice trim along the length of the fabric and matching the same point on the black frame, the fabric suddenly has two distinct orphrey designs. There is a narrow design and a wider design. Although this is not a full width of fabric, because some of the width has been used for projects, the remaining fabric can be cut into 5 orphreys: two wide orphreys and 3 narrow orphreys. The wider sizes which are approximately 7 1/2″ would work for an altar frontal or super frontal or pulpit fall. The narrower widths of about 4 1/2″would work for chasuble orphreys, a chalice veil, or even a banner. Now I will show you a different point in the Ecclesiastical Brocatelle. This time we will select the edge of the flower just below the previous point. stoles, and so on. Every piece used in a vestment set is of a different size and scale. Having a variety in the sizes, widths and scale of the orphreys helps them better fit the pieces for which they are intended. That is what a good Ecclesiastical fabric designer does this to make our lives easier when making the vestments. My thanks to the maker of this most special of fabrics! A job well done! Wakefield is available in the States through our store front coming in the fall of 2015. Similar fabric is available through the vestments houses in the UK. I hope this clears up a bit of the mystery surrounding the use of Ecclesiastical Fabrics with large pattern repeats. Next time, I’ll show you how the orphrey is attached to the Chalice Veil.